Some previously seen cover images for “Last Stand of the Wreckers” and one interior page minus wording can be found here, at Chris Ryall’s blog. The first issue is due to hit shelves on January 27th. The only deluxe figure on the pegs, Dirge from the new NEST sub-series was spotted at Target in West Hollywood, California, this evening. Target still has deluxes on sale for $10, so good value, and to all of you, good hunting! Discuss this sighting in the forums! A website called the Geek Syndicate has a short interview with Simon Furman, in which he discusses his work in comics, his involvement with and opinion of the live action films, and what Marvel characters he’d love to write. 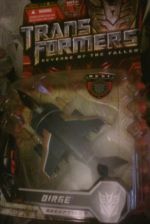 On Wednesday, December 9th, Toys R Us will be selling all Transformer Voyager-class figures for half price, $10.99. That’s none too shabby!